A while back Tony Edger (of the blog Fossils and Other Living Things) asked me to "...consider at some point tracking something you find in the field through the collecting and curation steps." I thought this was a great idea and would be a great continuation to show what happens when many of the fossils I have shown in the Fieldwork Friday come back to the museum. The museum has a great group of volunteers, who do many various task (picking micro verts under a microscope, screen washing, talking to museum patrons, working in the lab, preparing fossil, assisting with field work, making cast...). Our museum runs very smoothly thanks to the thousands of hours these individuals work every year. We had a "cataloging party" this week at work where the volunteers helped us catalog a backlog of fossils we have, so several of the pictures are of these great volunteers helping us out. Some of the hundreds of fossils we cataloged this week during our party. Thus far we have not collected anything large that requires preparation (or removing the fossil from its surrounding rock and stabilizing the remains). Most of the remains we have collected have been relatively small (that will change this summer), consisting of small isolated bone pieces and a few hundred trilobites. I though I would show a few of the trilobite specimens we collected in California and track their progress from the field to collections and study. Upon returning from the field, the trilobites are taken into our cataloging room where they are identified by our museum curator (to the species level if possible). During this process he will also take any measurements he may need from the specimen and make notes of these for his research. Our museum curator identifying trilobites from the Marble Mountains (above) and measuring specimens for his research (below). After the specimen has been identified it is given to me to enter into our museum database (we use the program Past Perfect). I then write out a specimen label for each item cataloged. These labels include the specimen number, identification, element, formation, age, locality and locality number. These labels are printed on acid free paper and are included with the specimen in the collections room. Specimens are places in the appropriate size box (or glass vial), with a layer of ethafoam cut to the correct box size and placed under the specimen. hite acrylic paint on top of the B-72 basecoat. number, to help with durability. Kay writing a specimen number on a small trilobite (above) and a labeled specimen, below. Photographs of the specimens are taken to enter into the database. Specimens are then moved from the cataloging room to our collections room where they are stored in steel Lane Cabinets and cabinets made by Steel Fixture (specialty built cases for geology and paleontology specimens). These specimens are now ready for anyone who would like to visit the collections to study the items. Superb items are put on display in the museum. Example of a picture for the collections database. This specimen (a piece of turtle shell) was collected during Fieldwork Friday #1. 6043 is the specimen number. The Dinosaur Research Institute has several scolarships available (not sure if they are for Canadian students only or not). One that perked my interest is the "Scholarship Supporting Neoceratopsian Research" created by Darren Tanke - pretty cool! 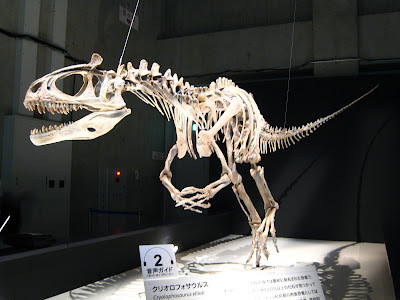 Cryolophosaurus is now on exhibit at the Fukui Paleontological Museum in Japan for a Gondwana dinosaur exhibit. This is only the fourth full cast of Cryo in the world (and the most up to date), with the others found at Augustana College in Rock Island, IL (the first mounted skeleton), War Memorial Museum in Auckland, New Zealand, and the Royal Belgian Institute of Natural Sciences. These cast are made by Research Casting International. The Australian Museum in Sydney also has a cast, but I am not sure if it is just a skull or the full body. Last spring before I moved to Colorado I was employed at Augustana College (the best job I have ever had btw - great boss and good working environment, I really miss it) and worked on Cryo on a daily basis. We packed up all of the new elements that had been prepared since it was originally cast nearly 10 years ago and sent them to RCI so a new, more accurate postcranial skeleton could be made for the Japanese exhibit. I am happy to see this picture of it now on exhibit! I really like the way they have it mounted. It is nice to not see a lot of heavy armature under the skeleton. I thought I would pass the picture on since not many of us will have a chance to see the exhibit. But if anyone does make it over there, I would love to see your pictures! You can read the official monograph on Cryolophosaurus for free here (PDF). Ann Elder, paleontologist, geologist, and the Chief of Resource Management for Colorado National Monument, passed away suddely this week due to complications from surgey. Ann had long worked for the National Park Service and began her career at Fossil Butte National Monument and later moved to Dinosaur National Monument where she worked until this past year when the jobs there were slashed. We were very lucky to have her at Colorado National Monument, here in Grand Junction. John and I had just seen her last week and were planning a exhibit at the museum of fossils from the monument. This was my first chance to meet Ann in person, although I had long knew her name and wonderful reputation. She was nice enought to let me use her office when a call I was trying to place would not work. She took the time to show me the best place to use my cell phone so the call would go out and I could wrap my buissness up so we could discuss the fossils. It is hard to believe that someone I just saw last week has died. And so unexpectedly! Life can be shoreter than we expect and maybe we should all take this moment to appreciate those around us a bit more. You never know when they could leave you suddely. Paleontology truly lost one of its greats this week. You can read more about Ann and her wonderful controbutions to paleontology here. If you knew her you may take a moment to leave your memories of her. If you did not know her I encourage you to read the stories left by others. Thanks to Jim, Doug, Chris and Lee for the links.